Founded in 1993, Pluspak OÜ is a wholesale packaging distributor for meat and dairy processing industries, servicing clients in Estonia, Latvia, Lithuania, and Russia, in Kaliningrad. Pluspak OÜ primarily offers Sausage casings, Packaging films, Thermo-shrinking bags and vacuum pouches, Boxes and trays, Machinery for meat processing, Milk-based additives for meat, dairy, ice-cream, and bakery industries. Milk-based additives for meat, dairy, ice-cream, and bakery industries. 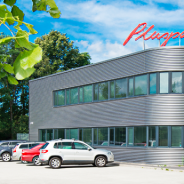 In 2004, a modern office and warehouse facility was completed in Tallinn, Estonia, enabling Pluspak to significantly increase its client base and offer improved logistical solutions. Our warehouse in Riga contributes to efficient operations in Latvia and Lithuania. Pluspak’s customer base includes all major meat and dairy producers in the entire region. Cellulose casings for frankfurters, collagen casings (edible, non-edible, films for packaging ham). Fibrous casings, polyamide casings (smoke-permeable, non-smoke permeable). Additionally, we offer customization of products, printing, and shirring. Line films (rigid, soft), cooking films, thermo-shrinking films, thermo-shrinking bags, vacuum pouches, boxes for ready-to-eat meals and raw meat packaging. Additionally, we offer full customization services for the products, and printing. Machinery for meat industry: processing equipment for frankfurters, including peelers and linkers. Concentrated milk- and whey-based proteins, whey powder, milk minerals.